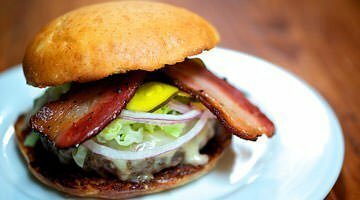 You are here: Home / Food Writing / Travel Writing / A Bit More Italy: What? More Steps! This is the third in a four-part series: You can read the entire journal from the beginning here. For me, the best way to figure out an Italian train schedule is to jump on the internet, pull up Italia Rail, and look on the site. Otherwise I end up confused and spend six hours going north to end up 1 hour east. Even so, I occasionally have a “wrong train adventure”. This was the case on my trip over to Monterosso. Normally one can get there from Modena in about two and a half hours, but my trip took two train changes and I arrived an hour after the train that left an hour after mine. Don’t ask me to explain that last sentence, just know that I’ve now been to Fidenza, and Sarzana. I couldn’t begin to tell you where they are, but they looked like places I wouldn’t mind visiting. The schedules are confusing; some of the trains pass through the towns you want to go to but don’t stop there. When I caught a local train from Monterosso to Corniglia, I saw my intended destination through the window as we whizzed past, and had to take yet another train back 30 minutes later. Oh, and they don’t always tell you what station you are at, so you have to keep your eyes peeled for the signs in time to leap off; great fun! 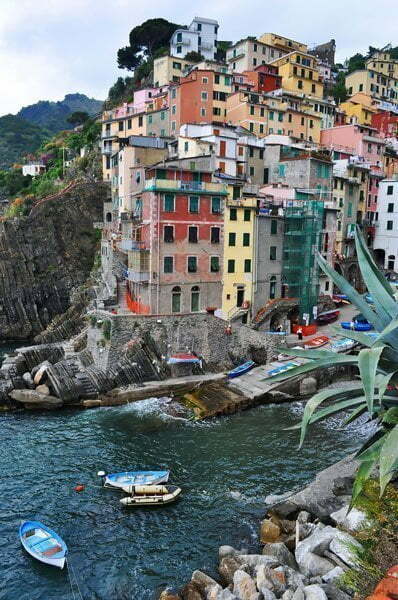 Cinque Terre, which means five lands, is made up of five towns along the “Italian Rivera”. Monterosso in the north, then Vernazza, Corniglia, Manarola, and Riomaggiore. This is an isolated area. No automobiles are allowed in the cities; you go from town to town by train, boat, or your own foot power. Most of the tourists are here to hike. The walking trails are absolutely spectacular with sheer drop-offs and unspoiled views of the Mediterranean. Most of the routes from town to town take about 90 minutes to traverse. Once you reach the towns, even on a warm summer afternoon, there isn’t a whole lot to do except hike, lay in the sun, make friends with the locals, drink the local wine, and eat. This used to be one of those places in the world that was an incredible find: no one knew about the area. Then the Rick Steves of the world started leading tours, and like almost everywhere else, the towns are now overrun during the summer months. Unfortunately (depending on how you look at it), most everything for tourists is closed in November – shops, restaurants, hotels… the towns are pretty much locals only, so I had much of the trails to myself. 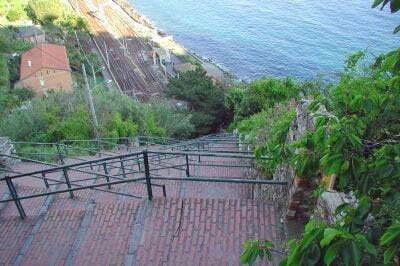 Arriving at the train station in Corniglia, one faces the somewhat daunting climb up 365 stairs to get to the town. I was going to stay at Da Cecio, a place highly recommended by friends, but as I expected, it was closed for November. Not much is open at this time of year, so I ended up staying in a room that a local family rents out to tourists. They charged me about $68 US, for a room on a cliff overlooking the entire bay. The family I was staying with dragged me to an enoteca packed with locals. Once again I was made to feel I belonged, and had a great time drinking wine, downing a number of fresh anchovies, and practicing my Italian. The most common question I got was, “What the hell are you doing here in November?” I just shrugged my shoulders and said I was a stupid American, which got lots of laughs. When I told them I was a food writer, they insisted on plying me with an never ending stream of fresh anchovies, octopus, and the ever present pesto. Once again I ended up trying to navigate my way up a steep cobblestone alley after having too much food and wine. I’m surprised I didn’t fall off a cliff. After breakfast the next morning, stopped at San Pietro, a Gothic church that was built in 1334. You’ll see it just outside of the train station, so it is a good place to stop when you are on your way in or out of town. 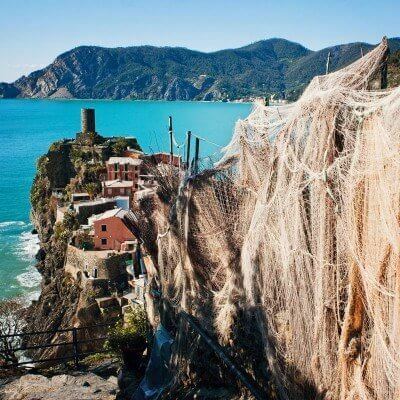 I headed southeast along a hiking trail to Manarola, a tiny fishing and wine town. A local wine called sciacchetra is everywhere, and I stopped to fortify myself; sweet, very sweet. I decided one glass was a poor sampling, so tried two others; still quite sweet, but warming; nice with some bread and cheese. After a quick walk through the town (most of the galleries were only open for a few hours later that afternoon), stopped at the 700 year old church of San Lorenzo. It’s a bit of a climb up to the very top of the city. It is small as Italian churches go, named after one of the first Christian martyrs. Beautiful frescos and a beautiful stained glass window helped offset a cloudy afternoon. The views were breathtaking. I am told that the church bells sound over the cliffs at 7 am every morning. From there, I picked up the trail and staggered onward. This section of the trail is called Via dell’Amore, after its romantic views. It is fairly easy going, and as the sun is quite low on the horizon this year, the shadows made it difficult to take a bad picture. It’s a beautiful, easy hike; well worth the effort rather than taking the train. After wandering for an hour, I arrived in Riomaggiore, where I would spend the night. Riomaggiore is the most “modern” of the five cities. The other towns are pretty much all older buildings, but this one also has newer residences intermixed. High above the town are the ruins of a 15th century castle. I walked around the town for a bit, and finding everything overpriced and touristy, took the road less traveled, a steep grade up the hill. It wasn’t long before I discovered another little enoteca populated entirely by locals. It was one of those situations where everyone turns and looks at you when you walk in the door. All the tables were full, and I stood there feeling awkward for a moment before a group of four squeezed over and motioned for me to join them. Most of the conversation was way too fast for me to understand, but they decided to order for me. This turned out to be trofie al pesto, a pasta made with chestnut flour, and yet another dish of anchovies. Even after just one glass of wine, I managed to get lost, winding my way up endless steps to the hostel where I was staying. If you are into hiking, this is the one village you will want to spend a couple of days. Some of them wind way up into the mountains, affording spectacular views. Be warned however, some of them are a bit dangerous. If hiking isn’t your thing, check out the Bar il Giardino. It’s a bit touristy, but wow, the view! Eat some salt cod, anchovies and drink wine while sitting overlooking the Liguarian sea. On my last day in Cinque Terre, I caught the milk train back to Vernazza. Much of the short journey is in dark tunnels so you might consider a flashlight, but every so often you burst into bright sunshine with a staggering view of the turquoise Mediterranean. Vernazza is my favorite of the five cities, though I hear it is overrun by tourists during the warmer months. If you were to picture an Italian fishing village 50 years ago, this is probably what you would conjure up in your mind. A picturesque harbor with lots of little boats pulled up onto the beach, and the dark Doria Castle with its imposing watch tower, clinging to the top of unbelievably steep cliffs, built to protect villagers from pirates. A stone spiral staircase takes you to the top of the tower, where you can watch the waves breaking far below. As with the other towns, the streets are cobblestone, lined with colorful houses, and the hills are terraced with endless rows of olive trees. Early in the morning, the little shops and cafes glow in a golden light. With all the olives being grown in this area, it isn’t a surprise that pesto was invented here. 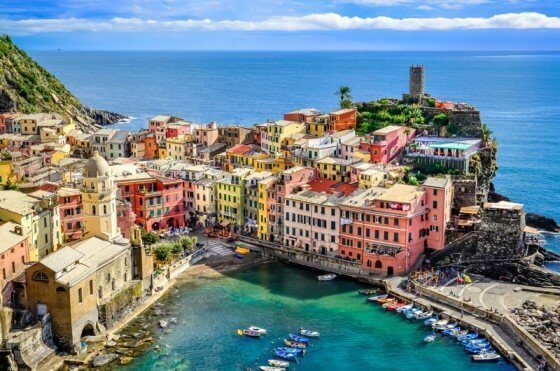 From Vernazza, it is an easy train trip to anywhere in Italy. On my last afternoon, a minerally Vino de la Cinque Terre with bread and cheese made for a perfect lunch. Some of the olive oil is fantastic, and breaking my rule against buying things when I travel, I put a bottle in my backpack to bring back memories on a dreary Portland afternoon.